The greater Caribbean has always been a popular destination for luxury yacht charters and the Turks and Caicos Islands are no exception. The Caribbean consists of over 7,000 islands – only 10% of which are inhabited – so you could return on a yacht every year and never experience everything the region has to offer. Featuring breath-taking waterfalls, white sand beaches and a culture as colourful as its sea life, the Turks and Caicos is a wonderful yacht charter destination. 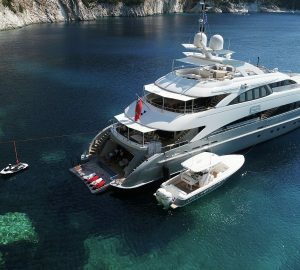 Here is a small selection of the charter yachts available - contact us for access to the full list. Located north of Haiti and south east of the Bahamas, the Turks and Caicos Islands are a British territory properly developed for tourism, while at the same time offering tranquillity far away from the usual tourist traps. 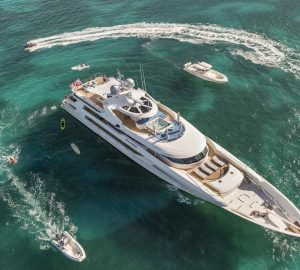 Whether you are looking for high end shopping or a low-key celebration aboard your charter yacht and out of the public eye, the Turks and Caicos Islands are an award-winning destination bursting with activities and unique locations. Twice the winner of the TripAdvisor Travellers’ Choice Award, the Turks and Caicos Islands took first place for ‘The World’s Top Island’ in 2015, and in 2016 Grace Bay beach in Providenciales was #1 out of the top 25 ‘Best Beaches in the World’. It’s not difficult to see why: this watercolour setting consisting of blues, greens and whites is little more than a glassy veneer to the world’s third largest reef, untrammelled by mass scale tourism. Relax on empty beaches under the pleasant Caribbean sun, or discover the diverse sea life by snorkelling or scuba diving bare metres down to the ocean floor. A large selection of chartered yachts are certified RYA Water Sports Centres so you can earn a certificate and learn to safely operate a tender or sail a laser boat during your sojourn. PADI Certified Training Centre Yachts such as superyacht AIR also give you the opportunity to obtain your PADI diving card to scuba dive freely in locations across the world. Stingrays are known to be found around Gibbs Bay and charter guests will have the opportunity to see whales such as humpbacks passing through the Columbus Passage from January through to April. For guests looking for action-packed adventure, the sheltered bays make excellent locations to kayak and paddleboard or sail a laser boat. There is plenty to do ashore however: Golf, horseback riding and parasailing are all easily accessible and fishing trips for blue angler are frequent. Shoppers will find an eclectic mix of crafts markets intermingled with boutique clothing stores and exclusive jewellers, all of which are duty free. 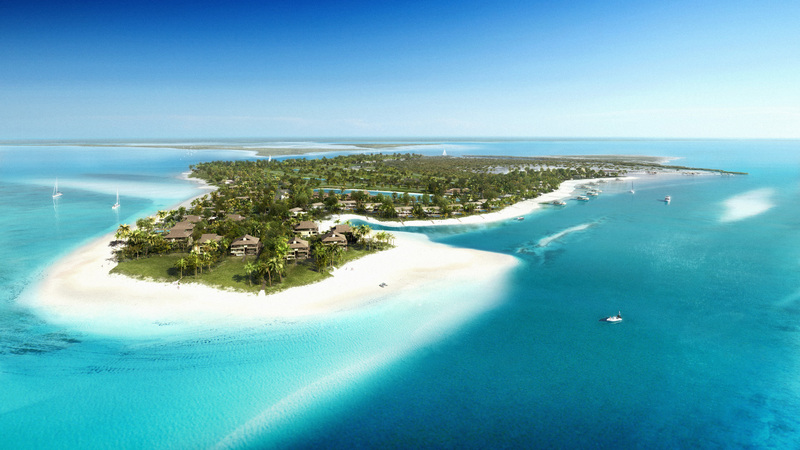 Parrot Cay hosts what some might call the world’s most exclusive resort and spa, yet there are hundreds of places any guest can go for pampering. The Turks and Caicos Islands’ untouched natural beauty is a perfect retreat for individuals seeking inspiration and solitude and for glamorous private affairs. Rainy days are rare throughout the Caribbean and the Turks and Caicos Islands experience 350 days of sunshine a year. The immaculate beaches have become the venue for stunning weddings and the outdoor element provides the very practical advantage of accommodating as many guests as the wedding couple wishes. Keep the magic of the day flourishing with a reception aboard a luxury yacht charter that has all the facilities for a relaxing and memorable honeymoon. When the sun goes down, give your guests a night to remember amidst the mangroves and lagoons that form tropical backdrop of the Turks and Caicos. 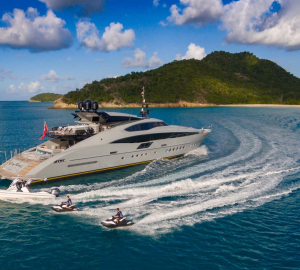 Yachts such as superyacht ACE have everything for an entertaining evening, from dancefloors and wet bars to relaxing Jacuzzis, swimming pools and movie theatres. Large deck areas and alfresco dining allow you to make the most of cays free from light pollution, where you can witness the Milky Way in all its splendour. Experience the superior living space and sheer luxury of a motor superyacht, or the exhilaration of sailing on the sea breeze on a sail boat, the choice is yours. Either type of charter worls well in this location. Get close in to the shore and enjoy the wonders of nature aboard a chartered luxury catamaran. In the Caribbean, chartered catamarans offer one big advantage over motor yachts: their low-density hulls. The evenly distributed weight means that the yacht does not lie so deeply in the water, enabling passage through shallow areas and closer proximity to secluded beaches. The area is very proud of its dedication to preserving the surrounding environment and eco tours are abundant. A local guide may help you to discover treasures that would otherwise remain hidden, such as the Conch Bar Caves which span 15 miles/24 kilometres. One of the largest karst cave systems in the Caribbean, this underground wonder contains stalactites, stalactites and lagoons and supports its own ecology. The Turks and Caicos Islands have an average temperature of 27°C/81°F. Light sea breezes take the edge off the heat and since sunshine is expected throughout the year, every season is ideal for a luxury yacht charter. Book your charter through CharterWorld today and discover the wonders of the Turks and Caicos Islands for yourself. Let us know if you would like more detailed information about renting a yacht in Turks and Caicos . In close proximity to Turks and Caicos are a number of exciting sailing destination.